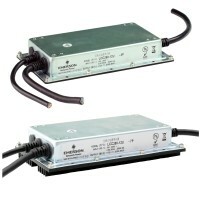 The LCC250 AC-DC power supply is a fully-enclosed conduction cooled series delivering full useable power at high temperatures. The LCC250 series, with IP64 protection against the ingress of dust and water, is ideal for applications such as outdoor signage and telecom installation like antenna and base station equipment. The power supplies are equally suitable for indoor use, such as in control consoles, indoor signage and desktops for medical applications, where the absence of cooling fans can help minimize dust and noise. Size (L x W x H):7.000" x 4.000" x 1.100"